As an associate in the office of Phillip G. Willard, Lucian T. Hood designed this modernist Riverside Terrace marvel in 1953. 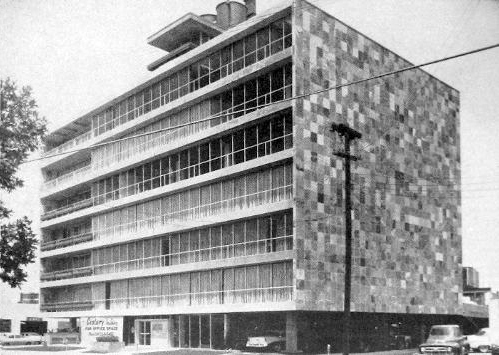 The University of Houston architecture program was in its infancy in 1952 when it graduated only a handful of students. Yet two of them—Kenneth E. Bentsen, FAIA (1926 – 2013) and Lucian T. Hood, Jr. (1916 – 2001)—went on to have extremely successful careers. Bentsen worked exclusively for commercial and institutional clients and produced award-winning buildings for banks, hospitals, and universities. His best-known project was the Summit (1975), a professional basketball arena for the city of Houston. Hood, however, focused mainly on residential architecture. 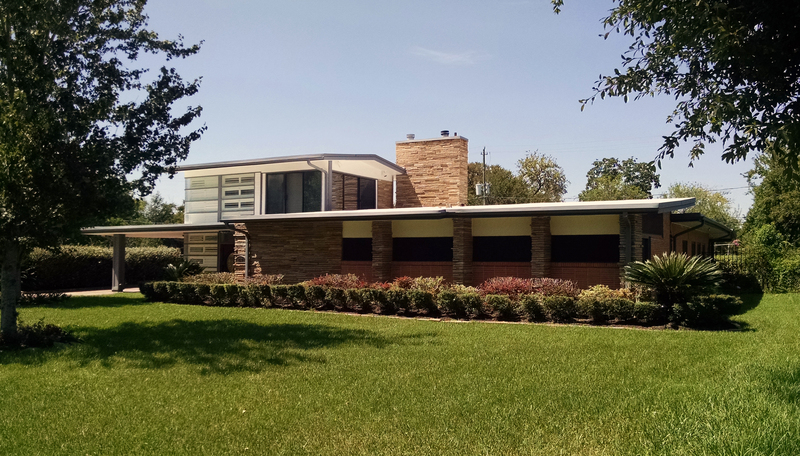 At his peak in the 1980s, he had one of the most successful residential design practices of any Houston architect. Although he did most of his work in Houston, clients came from other cities in Texas and neighboring states. After he retired, others continued his work, offering Lucian Hood designs to those who associated his name with fine design and high quality. Designing large, expensive homes maintained Hood’s clientele of wealthy and renown business-people. Such is the case with this vast, ranch-style home built and designed for Houston businessman Marvy A. Finger and family. To read the full article and view extended endnotes click here. To view more of Lucian T. Hood’s designs scroll down. 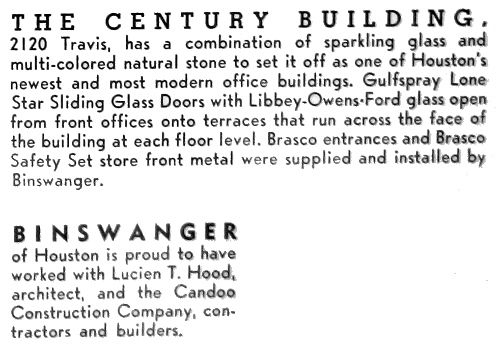 This advertisement by the Binswanger Glass Company shows The Century Building (1956) as it appeared upon completion. 4127 Drummond, Houston (1952). 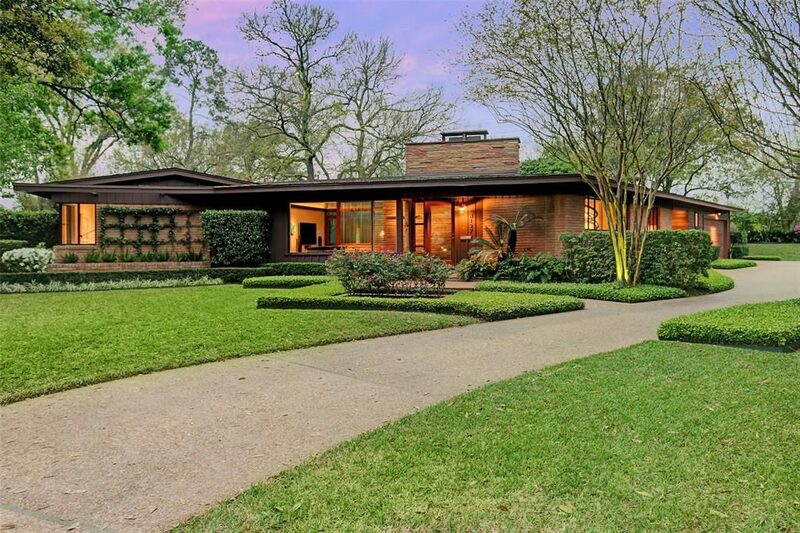 Another of Hood’s modernist designs with Philip Willard, this one in Houston’s Ayrshire neighborhood has a sprawling plan with splayed wings that envelop a patio and swimming pool behind the house. 3801 Olympia, Houston (1985). During the 1980s Hood designed many houses in the popular Georgian and Federal Revival styles, reflecting the conservatism of the era. 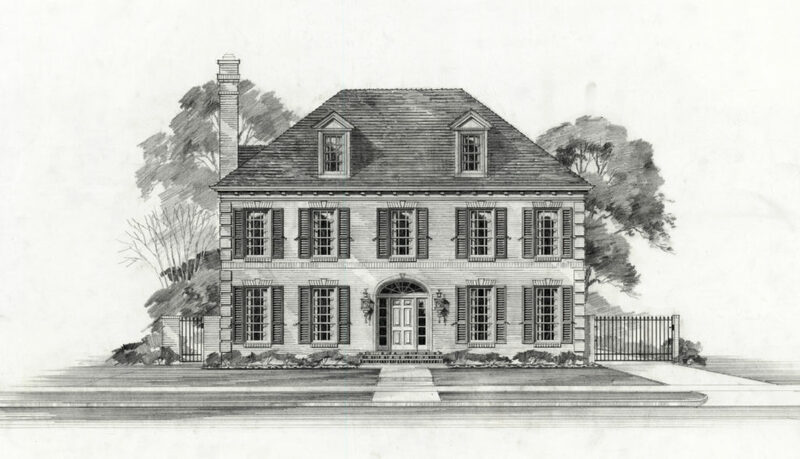 Hood’s client, a homebuilder, did not actually construct this design at the address indicated on the drawing but may have built it at another location. 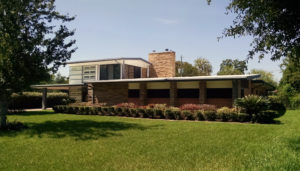 7632 Del Monte, Houston (1973). 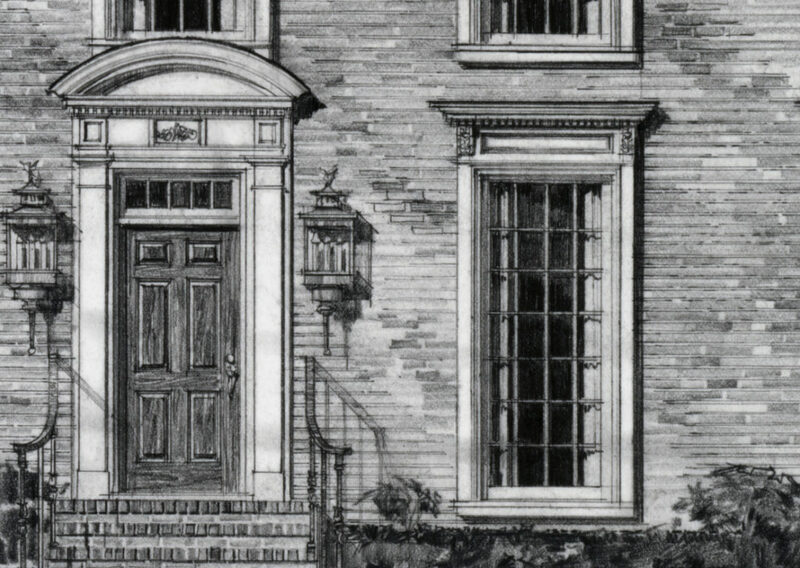 There is an enormous amount of detail in Hood’s rendering of the townhouse, which can be seen only when the image is enlarged. Drawn by hand with a graphite-lead pencil, the individual courses of brick are represented with a grainy texture and defined by mortar lines between them. In the windows Hood has drawn the thin wood muntins that separate the panes of glass, and behind the glass are curtains with folds. The muntins cast wavy shadows on the curtains. Buffalo Bayou, Century Building, Compaq Center, Creole architecture, Finger, French, Georgian Revival, Kenneth E. Bentsen, Lakewood Church, Lars Bang, Louisiana, Lucian T. Hood, Marvy A. Finger, Memorial Creole Apartments, Philip G. Willard, Riverside Terrace, Robert P. Woltz, Roseneath, San Antonio, Talpa, Tanglewood, The Summit, U.S. Army Corps, University of Houston, William Carl, Woodway Dr.